Hi friends. I just wanted to update you on the crochet lap blanket that I've been working on for the winter. In case you missed the post I did of this lap blanket I'm making, and the details for the yarn, and pattern, you can click HERE. Shown below is how much progress I've made on the blanket. I'm more that half way finished crocheting this blanket, and I just need to finish a small section of it. It will be donated to our annual crochet sale that we will have at my church in the fall. I will be so happy to have this lap blanket all finished and then I'll be on to more crochet projects of course. Do you have any fun, and crafty projects that you are working on right now? Wishing you all a nice weekend and see on Monday for Cooking and Crafting with J & J! It's very beautiful, even more because you're donating it. How happy the recipient will be! It's really coming along! I love the colors!!! Those colors are GAWGOUS as we say here in the south. Great job Julie! That is a beautiful blanket, Julie. My eldest granddaughter would love it because it's purple! Julie, I just love this color combo! It's looking great! I just love the pattern and the colors! How pretty! Wow, I give you so much credit! THAT right there is NOT EASY!! I have no creative bone in my body either, so man... Oh man... NICELY DONE! This is lovely, Julie, and such pretty colors. This is so pretty!! I love the colors!! Thanks so much for stopping by!! That blanket will be the first to sell at your sale. 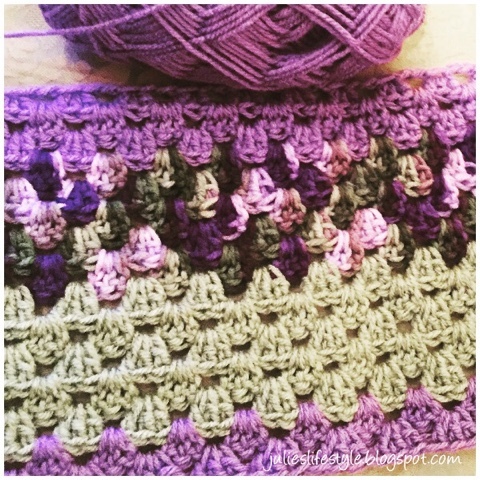 The variegated yarn looks just like rows of flowers. This is just the prettiest piece Julie! The colors scream spring! Love the colors and the lap blanket. I am working on a Little Baby Girls' quilted blanket for a friend. I am also working on crocheting a soft baby blanket for her also. Someone will be so happy to get that blanket - it's beautiful. Great work and I just love its beautiful color.. It is beàutiful Julie and so even! You are an accomplished crochet blanket maker! Now if we lived nearby maybe you could teach me?! My mother did such beautiful work, even into her 80s when she made me an exquisite tablecloth with very fine cotton. OH Julie, the blanket is turning out just beautiful. I love the bands of color in it. I am working on some sewing projects and some granny squares, that I decided to do for a blanket to donate. Great blanket, Julie. I love the colors. Right now I am knitting a prayer shawl for one of my son's friends mother who has recently had cancer. I also just finished sewing another pair of jeans. so pretty, love the pattern and yarn changes. Soon it will be done and then you will take a deep breath and start a new one! we are working on a couple different things - baby afghans, cloaks, fun twirl skirt and more! busy hookers don't get in trouble! How pretty! I love the colors. I'm sure your church will appreciate such a lovely donation for the sale. Thanks for sharing at Snickerdoodle Sunday. I really love the color combo! You've made a lot of progress, and for such a good cause! I just started a lap blanket yesterday Julie, using some leftover yarns I have! I love your pattern, I'm going to go check out your other post. Love the yummy colors! This is just so pretty Julie. My grandmother taught me to crochet as a girl and your lovely work reminded me of her. Thank you for sharing @Vintage Charm! Love the colors and the pattern too! Thank you for sharing at The Really Crafty Link Party this week! Pinned! Ahhh! This is gorgeous, my friend! I am in love with the colors you used and the pattern is divine. Hugs to you! I love the blanket and it is full of my favorite colors. Thank you for sharing this with us at Sitting Among Friends on Wednesdays. I hope to see you again this week. Julie, That pattern and the colors are so pretty! Thank you for sharing your progress with us at Brag About It! Wish I could say I was working on something as beautiful. Have a lovely week! Julie, your blanket looks lovely. I adore anything that is crocheted. The one big thing I am working on at the moment is getting our rooms painted and purging. I'll be glad when it's finished! Thank you for sharing today and have a lovely day. I love the colors and the sheen, and best of all that you're donating to a wonderful cause! Thanks for sharing with us on Throwback Thursday!! 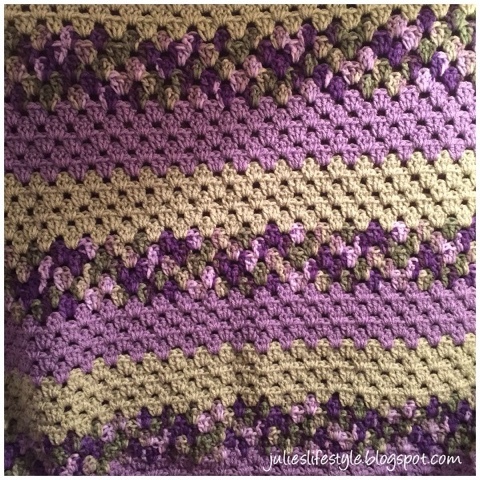 What a pretty blanket, Julie! I love the pattern you are using and the colours too. Thank you for being a part of our Hearth and Soul Hop. Lovely blanket! Thanks for sharing at Submarine Sunday!